For my latest post I’ll move away from my usual topics of astronomy and space travel and I’ll talk about an interesting unsolved problem in mathematics which is: ‘Is the number 196 a Lychrel number?’. What is a Lychrel number? 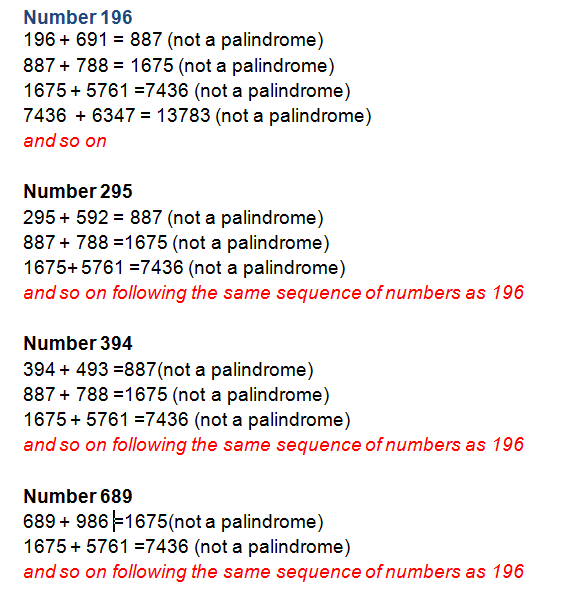 For nearly all numbers, if you carry out the reverse and add process multiple times you will eventually arrive at a number which is the same written backwards, known as a palindrome. Some examples are shown below. 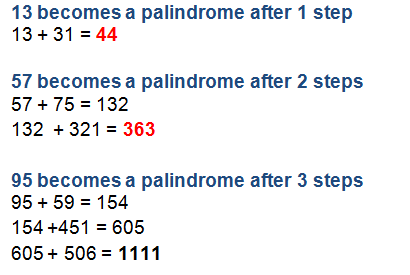 The vast majority of numbers lower than 10,000 form a palindrome in 4 or fewer steps, although there are some notable exceptions. For instance, as illustrated in the notes at the bottom of the post, the number 89 requires 24 reverse and add steps before we get to the 13 digit number 8 813 200 023 188, which is a palindrome. a number which will never result in a palindrome no matter how many times the reverse and add process is carried out. The term Lychrel was coined by the computer scientist Wade Van Landingham, who has spent a lot of effort in the search to determine whether or not 196 is a Lychrel number and created a website dedicated to the search http://www.p196.org/. On this site he states. “Lychrel” was simply a word that was not in the dictionary, not on a Google search, and not in any math sites that I could find. If there is any “hidden meaning” to the word, it would simply be that it is a rough anagram of my girlfriend’s name Cheryl. It was a word that hit me while driving and thinking about this. I liked the sound of it, and it stuck. There is no secret to the word. No one knows for certain if 196 is a Lychrel number, but the question has been investigated by many computer scientists over the years. In 1990, a programmer named John Walker applied 2,415,836 reverse and add steps to 196, no palindrome was found and the final number was a million digits in length. Since then as computers have advanced, the reverse and add process has been applied more and more times. In February 2015 a computer programmer called Romain Deb carried out the reverse and add process 1 billion times. The final number had 413,930,770 digits and is so large that, if we were to print it out, it would be over 1,000 km long. During these 1 billion steps process no palindrome was found. 196 is not the only candidate Lychrel number. If we consider all the numbers under 1000 then 196, 295, 394, 493, 592, 689, 691, 788, 790, 879, 887, 978, 986 are also candidate Lychrel number. The interesting thing is that, if we carry out the reverse and add process for all of these numbers with the sole exception of 879 and 978 (which is 879 its digits reversed) then we arrive at the same sequence of numbers as if we had started at 196. Some examples are shown below. For the reason 196 is referred to as the ‘seed’ of all these other candidate Lychrel numbers. On that note I’ll sign off for now. I hope you’ve enjoyed the change of subject :-). My next post will be on the more familiar topic of astronomy. Very interesting, I really enjoy reading stuff outside my comfort zone. On my bookshelf is “Palindrones and Anagrams” by Howard Bergerson that has been a source of things to put on the blackboard or now whiteboard for my students to read and ‘ponder’. However it is entirely word-based with no mention of Lychrel numbers. Thanks for adding this to my continued learning. I’m recently retired but still active and will share this with my Science Teacher colleagues. In one of the ‘improbable’ coincidences which I’ve almost grown weary of ‘explaining away’ the past few years, the fellow whose writings on the cosmos here I’ve quickly learned to love and respect turns out to also be interested (‘obsessed’, or even ‘in-hebriated’ as my friends call me) with the gang and gamut of numbers we are condemned to love/hate in this quantifiable world. But we can’t look away. I’ve spent as many otherwise ‘billable’ hours on primes, for example, as most folks do on food and shelter. God help me. Not to mention a few hundred posts on letter palindromes on my WP site. I enjoy, for comic effect, pretending that I see a cosmic ‘hand of God’ in the pure coincidences I discover nightly. My question, pending research on this, is how a number can be included in a set by a definition which asserts a negative: i.e. “a number which will never form a pallindrome after infinite iterations”. I mean, I’d describe myself as a fellow who ‘win never win a lottery’ (other than discovering your enchanting site, that is) but am aware of the N-P halting mess surrounding such a statement. I do wish this whimsical fellow-traveler well. and will be smarter in the morning after I pretend to ‘solve’ the question while falling asleep. Thanks for the gripping post my friend. Grips me at least! Thank you for your interesting comment. I too am strongly tempted to spend hours when I am/should be doing my [paid] day job on my [unpaid but high enjoyable !] blog. I try to resist this temptation ;-). It is perfectly possible to define a set of all the Lychrel numbers number in base 10, i.e numbers which will never form a palindrome after an infinite number of reverse and add operations. Clearly, it is only possible to prove by carrying out a finite number of reverse and add operations that a number does not belong to this set by eventually finding a palindrome. The only way that it would possible to prove that 196 is a Lychrel number would be for someone to provide a mathematical proof that 196 never forms a palindrome after an infinite number of iterations. Despite decades of effort no one has ever been able to do this and it may be the case that no proof may ever be found. which mathematicians have been trying to prove for the last 300 years and no proof has ever been found. Thank you from the heart for your typically satisfying reply. Three hours of supine contemplation of ‘196’ netted me only attack strategies, and not the hoped-for ‘I have discovered an amazing proof, the margins here being too narrow..’. Watching the conjecture more resemble a ‘windmill’ the closer I looked, I broke down and checked the on-line literature. Seems that this problem is what engineers might call “mature technology’; it’s been exhaustively brute-forced, and to no generalizable avail, well past any ‘close look at the enemy’ which I could have independently surveiled. 2) I may investigate any light it shines on latin-alphabet palindromes, using a base-24 ‘number system to generate palindromic (but mostly gibberish) ‘words. As in ‘ABC’ plus ‘CBA’= ‘DDD’, for what that may be worth. 3) And lastly, given the roughly 10^80 protons in the observable, times perhaps 10^40 ‘events in each one’s ‘chat log’ since the big bang, do we at least have a working limit on the number of computable operations we have any right to speak of? Maybe. I’m too dim-witted to pass judgement on this attractive thought. It does tie in with larger issues in Cosmology, and so I’m safely ‘on-topic’ here, although long-winded. (I’ve noted that you elegantly ignore the ALL CAPS ‘Eureka’ lone-wolves here, and wisely so.) Hoping I haven’t made a pest of myself. The next solar-system ‘way-point’, on the 21st approaches; I’m supposing that it will be ‘post-worthy’ only if it, like, doesn’t happen(!) Which the Bohr-ists will enjoy explaining as a result of ‘no observer was watching the Moon>> no collapse!’ Unlikely though,with 30 million sun-glassed ‘mericans’ watching the cat live or die. Very interesting analysis. However, I think I’m going to turn off at the idea of strings of numbers thousands of kilometers long. I’d be delighted if you found a minute to read my last post, on ‘simultaneity’ and delusions/ confusions there-about. Many thanks; they are both light-weight 3-minute reads, and neither one worth allowing the Lovell to drift off-target for, ha. Interesting. I have an incredibly non-mathematical mind, but it’s nice to read small articles which make me wish I understood numbers more.